The nature, and the creatures, always make way to live in harmony with each other, be it dense virgin forests, gardens in our backyards or be it a small pot. My pots, almost over fifteen feets above the ground, no exception to this. The number of pots and greenery attracts a number of creatures to my plants including chameleons, dragonflies, butterflies, honey bees, and spiders of different types, also including one kitty, which used to hide behind my pots. Small spiders, having amazingly designer backs, are usually found on the leaves of my rose plants. Though, their backs have amazing designs, due to their small size, I haven't been able to capture one of these. Though I haven't been able to capture images of butterflies, due to shy nature of these creatures, I never tried capturing honey bees, and the spiders, most of the times are very small to be captured with my cellphone camera. 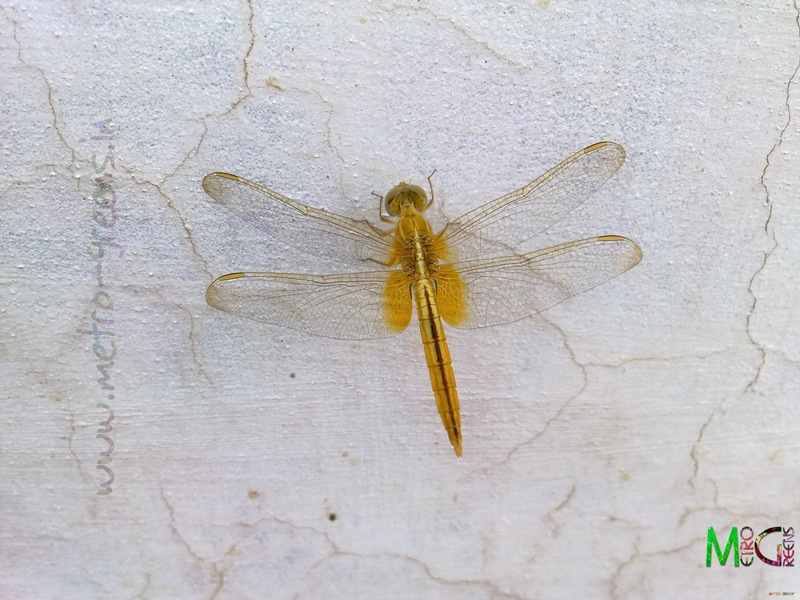 What I have captured, are snapshots of some dragonflies, one chameleon, which, last summer, had become a regular feature among my pots, owing to the comparatively colder conditions in between the pots, due to regular watering and also due to the shade provided by my plants. 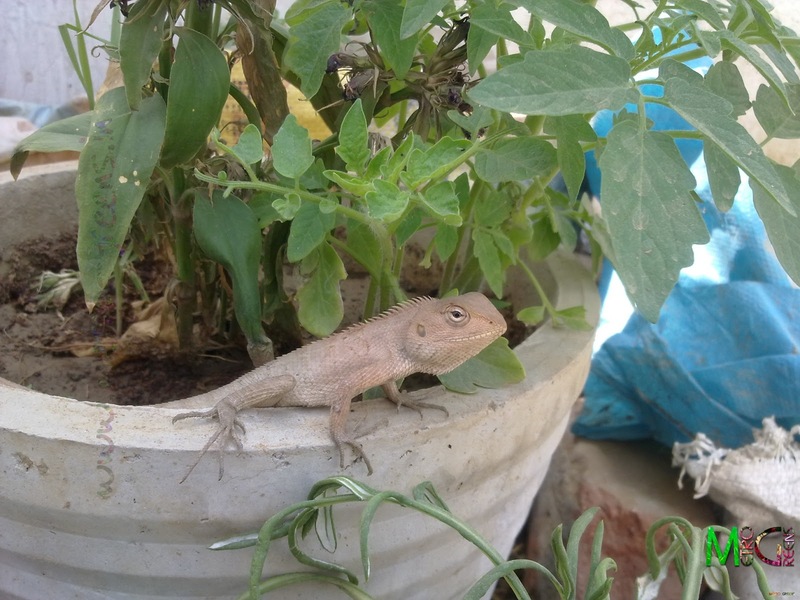 And, here he is, Mr. Chameleon, sitting calmly on a pot, under the shade of my tomato plants. Dragonfly, having grabbed a wire on a day having overcast conditions. 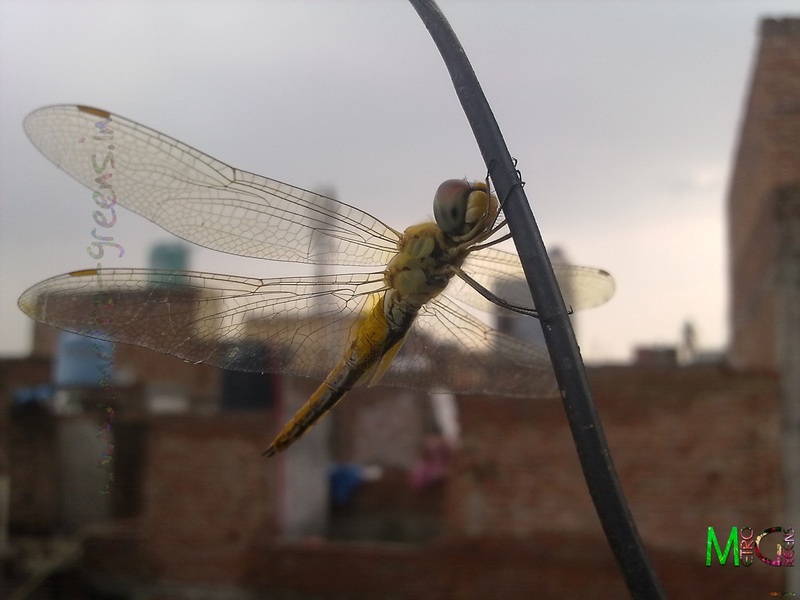 I clicked this beauty one fine morning, sitting on a boundary wall of my roof, near my pots. Thanks for the invitation, Andrew. I'll love to be in vicinity of other gardening bloggers. I'll join the Blooming Gardening Blogs Community. You get plenty of lovely visitors. Yup! That's true, though, I'm always not there to welcome these lovely visitors. Still, I miss some lovely colourful butterflies.